Chance has allowed a couple of North Cheshire Away Days. The Cheshire One had spent part of half term down in Bedfordshire. Mid-week a Virgin train whizzed her and Boatwif back to Macclesfield from Milton Keynes. The Captain drove up later and tackled the top Must Do Cleddau job, a boat wash.
A germ of an idea had formed in Boatwif’s mind: perhaps just a gentle little cruise, just to Marple, only about 90 minutes further north, then a walk down the Marple Flight to the bottom… maybe? The idea took root – and by early afternoon on Wednesday the boat’s engine was teased into life. For the last couple of years nb Chrysalis has been moored up beside the towpath opposite Cleddau’s home berth. Now it has gone, a fibre glass cruiser being moored in its place. it was in Hungerford in July 2015 that her owner had organised troops of small children through Cleddau and two other boats. She is a long way from home now … About a half mile south is the winding hole, where another boat was already manoeuvring around. 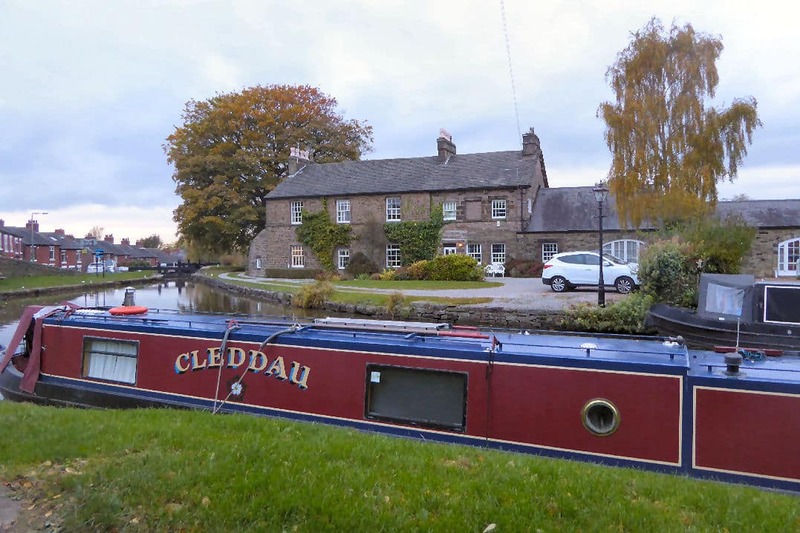 Cleddau headed the 3½ miles towards the junction of the Macclesfield with the Peak Forest Canal. Somewhere before High Lane Cheshire bleeds into one of those anonymous sounding administrative names, Greater Manchester. overlooking the Marple Top Lock. bound for Bugsworth after a trip up to Upper Mill on the Huddersfield Narrow Canal. Thursday morning came – now was the opportunity to walk down and back up the Marple lock flight. This town is in the Metropolitan Borough of Stockport, yet nothing seems metropolitan about the towpath walk down the lock flight. An initial terrace of houses and then old canal side buildings further down are easy on the eye. To the north east there are frequent glimpses of the Peak District hills. Downhill the locks fall, in increasingly rural glory. The trees were in stunning colour and where leaves had drifted to the ground there was a crisp underfoot carpet. A Canaltime hire boat was ahead, working down the locks. Surges of water were pouring down the flight, exiting as white water torrents from the by-wash below each lock. there was the first sighting of the Marple end of the railway viaduct. There it is, standing even taller than the impressive aqueduct. Far below flows the River Goyt. An arresting red sign warns of danger. One side of the aqueduct has a towpath and the protection offered by a stone wall – the other doesn’t! down allows for close up views of both the aqueduct and the viaduct. In 1860, (see Wikipedia article) to overcome frost damage, bracing was added to the stone arches, presumably to stabilise and strengthen the structure. And fire engines too, it transpired. There had been the sound of distant sirens: the fast flow of water was at the request of the Fire Services who needed copious amounts to fight a blaze further along the canal. A windlass-waving home owner was at Lock 2, winding paddles fast, flushing away the rising water level about to threaten his home. The moments passed, the by-wash flow decreased. One canal side house was saved from flooding – but 11 luxury new homes were destroyed. (See here). Back up the hill, back up the 209 feet incline, back past locks operational since 1804, back past stunning foliage and autumn colour. but just to Higher Poynton. From time to time the sludge of leaf soup needed clearing from the prop. Early Thursday afternoon Cleddau was back after a 7 mile return trip, back from her very last little cruise of 2016, back at 53N 2W.